The Suncook Valley Railroad initiated independent operation on September 24, 1924. The road began operation over the leased Boston & Maine Railroad Suncook Loop trackage (from the east side of the Merrimack River at Hooksett north to Bow Junction) on June 8, 1936. This article is intended to discuss B&M rail service to the village of Suncook in between those dates. Sources This map depicts the B&M's Suncook Loop and environs from Hooksett at the south, to Bailey's Quarry in the east, and to the Concord depot in the northwest. 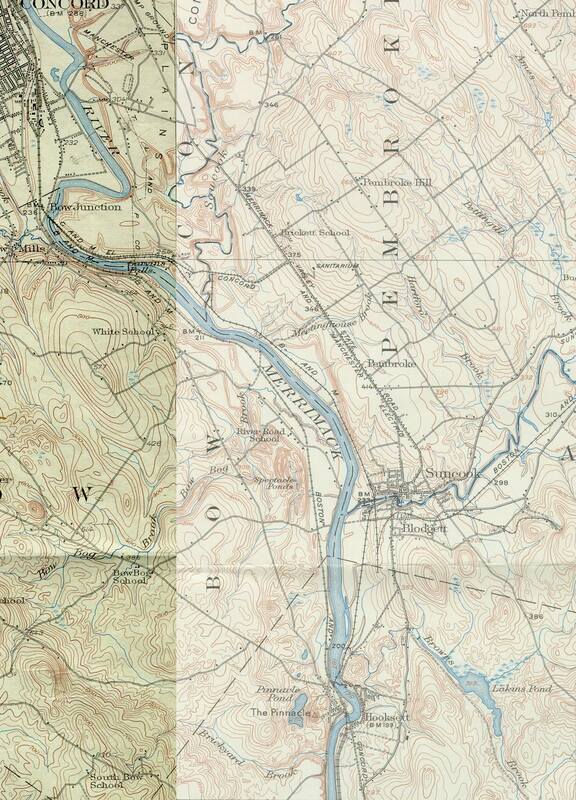 It is a composite map created from the 1921 USGS 15' Suncook Quad and the 1927 15' USGS Concord Quad, and is cropped (approximately,) from W 71°25' to W 71°32'30" and from N 43°5' to N 43°12'30". Click for Full size. Passenger service is generally well covered in B&M Employee and Public Time Tables. The chart below (in .pdf format, click for larger version) resulted from a comprehensive study of the former; further research on passenger service is required, however, in order to include accommodations, railway postal, interurban and bus services. Some explanation may be instructive so that the chart can be fully understood. The horizontal axis shows individual train schedules through time from initial SV operation until lease of the Loop by the SV. Color continuity may reflect a constant train service or may represent a change in B&M train number without a significant accompanying service change. Two closures of the Hooksett bridges can be noted (light purple highlighting,) first in the winter or spring of 1927, and lasting until Aug 8 of that year, and the final curtailment of service over the Hooksett bridges on January 11, 1935. The vertical axis is time of day during the period. Gray areas between the black highlighted SV train times represent the short line's layover at the Suncook Yard, and thus indicate where connections were made between the two railroads. 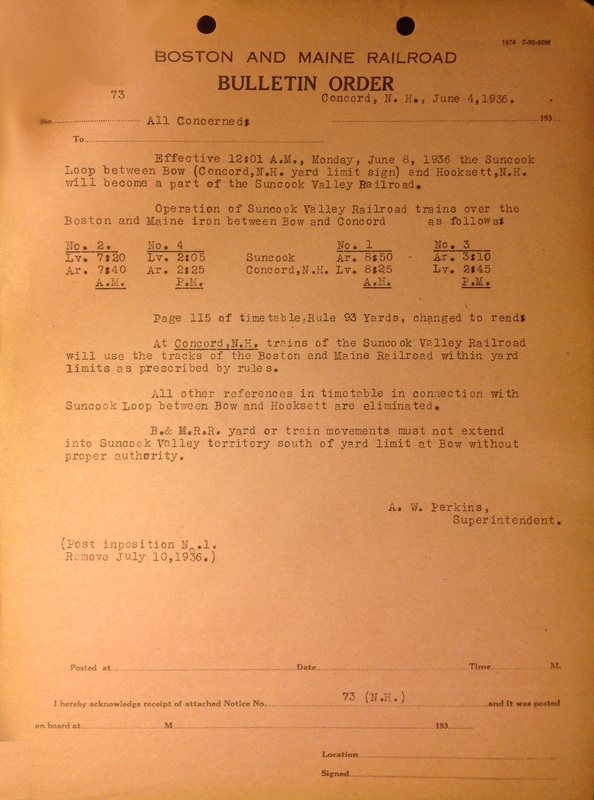 The 1926 FTSB shows that a pair of local trains was assigned from Concord to Suncook and from Suncook to Concord on a daily except Sunday basis, correlating with the frequency of SV mixed trains. Running south after Train 812 departed Concord, the turn arrived in Suncook to leave cars for Suncook Valley Train 1. Facilities served at Suncook included the Suncook freight house, the three large Suncook Mills complexes-the China, Pembroke, and Webster cotton mills, Fowler Brothers’ grain mill, Fred Saltmarsh’s coal and wood yard, E. Baker & Co.’s coal pocket, and a wood flour manufacturer (operated under a succession of names,) located just north of the Suncook freight house. The B&M's Suncook agent was also responsible for two additional, important customers: Bailey's Lumber Co. and the C. A. Bailey granite quarry, despite the fact that the Suncook Valley RR was responsible for the actual switching duties. Three times weekly, freight service was supplied to Hooksett, and we know the train at least occasionally crossed the Hooksett covered bridges from the note in the Symbol Book regarding running back to Concord via the main. At Hooksett, the Suncook local would have served the Dundee Mill, where crash, a coarse cloth used for toweling and coats, was woven until about 1928, as well as Head's brickyard and the PSNH hydro facility (formerly Manchester Traction, Light, and Power Co.,) the latter leasing a portion of the shared Cotton Track along with Dundee. This turn was the sole freight service to the Hooksett depot and freight house, as no other local freights were scheduled to run between Concord and Manchester. After returning to Concord at around 9:45 AM, the Suncook local then made a trip part way up the Claremont Branch to serve the quarries on Rattlesnake Hill near West Concord, also known as Garrison on the B&M. No provision for evening service to Suncook can be found, which would have delayed outbound merchandise service until the next morning, keeping in the character with the B&M's drag freight operating scheme still entrenched in the mid 1920's. The nature of traffic originating from some of the customers served by the B&M's Loop, however, demanded more timely outbound shipments of L.C.L., and the railroad responded to its customers needs. An August 22, 1927, memo from S. E. Miller, General Superintendent, B&M, states that the local, "runs from Concord to Suncook and return twice and does the so-called Stone Hill work." This added trip provided much improved service for Suncook and Valley shippers and would be included in the next FTSB operating plan. The 1927 FTSB showed a very similar operating scheme to that of 1926. The round trip was now officially one local, rather than the previous two, and it was run on the same frequency as the previous year. It arrived well after Suncook Valley Train 2, which had also met Train 812 earlier. After its switching duties were completed, the local awaited the 8:30 departure of B&M Train 303 before itself heading north back to Concord. Again, freight service was supplied to Hooksett three times weekly, and it is believed that this train ventured across the Hooksett bridges in order switch the freight house on the west side of the river. However, there remains a possibility that the two Boston-Concord locals, one each direction daily, could have provided service along the NH Division main line through Hooksett. Arriving back in Concord around 9:00 AM, the Suncook local continued to run to Garrison to work the quarries. After that work was complete, the local would make a second trip to Suncook to pick up any LCL cars at the freight house or dropped by SV Train 4 at 3:20 PM. Presumably this train had to make it back to connect with the southbound merchandise train, O-B 2, in order to best serve Suncook and Valley shippers. O-B 2 arrived at Concord at 7:00 PM and left at 7:50. Complicating this however is the fact that B&M Train 3604 was due to leave Concord at 3:40 PM and was scheduled to arrive in Suncook at 3:56. The local surely could not be counted on to pick up merchandise cars and run the distance back to Concord in less than 20 minutes. We can therefore conclude that the local waited until after the passenger train had left, which would still give it more than enough time to make the round trip and get the car spotted in Concord to be sent south in O-B 2. Beginning with FTSB #17, in effect on January 1, 1929, the B&M changed the format of the publication. This change appears to have been made near the conclusion of many of the changes instituted under management of the railroad by President George Hannauer, such as the opening of the new Mechanicville hump yard on January 14, 1928. The freight services also were reconfigured in order to achieve operating efficiencies previously unheard of on the B&M. Undoubtably, these changes must have effected service on the Suncook Loop in some manner, but until further FTSB are located, a few other documents do shed some light on the manner in which the branch was worked. The April 1929 Minute Man Freight Service Merchandise Car pamphlet shows that a daily Less-Carload-Lot (LCL) car was sent from Nashua to the Suncook Valley RR scheduled to permit next morning delivery. In addition, a car left Boston’s “A” House (located in East Cambridge,) destined for Suncook as well. However, this latter service was only guaranteed to deliver merchandise the second morning. It was not a direct car, so presumably, goods were sent to Concord where they were then transferred to another car at the Concord freight house. The 1927 FTSB leads one to believe that both of these cars could have come into Concord in Train B-O 1. This train left Boston with merchandise cars at 9:15 PM, and picked up and dropped similar cars at the major cities enroute. Nashua was scheduled for 11:45 PM, arrival in Concord was 3:15 AM. By 1932, the FTSB indicates that any Nashua car would have been picked up by 49’s Extra and dropped in Concord, while B-U 1 would have hauled Boston LCL direct to Concord. Due to the freight scheduling efficiencies introduced ca. 1930, B-U 1 made it into Concord at 10:10. The schedule for 49’s Extra is not known, but it did arrive before B-U 1. With the general reduction in service that occurred in response to the ever worsening Depression, the southbound train from Lincoln lost its symbol freight status, was cut back to Concord, and was required to make the evening run to Suncook and Hooksett to provide LCL service on an as needed basis. As the Depression wore on, the B&M continued to modify its freight services to accommodate the lower traffic levels. In Suncook, this meant that there would no longer be a dedicated morning local service. Instead, the B&M began running Symbol Freight F-C 1 to Suncook on an as needed basis after it otherwise completed its run to Concord. It was scheduled to arrive in the capital at 8:30 AM, which allowed it to get to Suncook in time for the Valley connection- SV Train 1 was not scheduled to leave Suncook until 10:00 AM. The variable service nature implied by the B&M’s schedule is a foreboding sign of things to come. Meanwhile, the Bristol and Franklin local was restored to its previous status without a morning Suncook trip. The April 26, 1936 B&M FTSB gives a look at freight service to Suncook after the Hooksett bridges were closed. The Worcester to Concord symbol freight, W-C 1, has now assumed the duties. After arriving in Concord around 8:15, that crew was assigned the job of running to Suncook or Hooksett as required. The continuing suggestion that the service frequency is variable helps one to understand the situation leading up to the SV leasing the Loop trackage. No mention is made anywhere of afternoon runs to Suncook, so a distinct possibility exists that afternoon merchandise service from Valley points had been curtailed entirely. The last B&M freight train to operate over the Suncook Loop prior to its lease to the SVRR was X246, which had run down to the Emerson mill at Hooksett on 6/6/36. Independent operation of the Suncook Valley Railroad between Suncook and Center Banstead was a direct result of the B&M seeking ways to cut their operating losses in the 1920's across their myriad of branch lines. It is not, therefor, unsurprising that the B&M kept an eye on the Suncook Loop itself as yet another branch to reduce the operating losses from the service required on such a low density line. An early indication of the B&M's desires was touched on in a memo from S. E. Miller to J. W. Smith on 8/22/27, regarding the Suncook local/Stone Hill switcher. While the memo is cryptic, Mr. Miller suggests that the Suncook Valley may not be able to take on some unspecified new duty, believed to be afternoon service to customers in Hooksett, as it would probably interfere with their existing train scheduling. After a conversation with SV General Manager Fosgate, the matter is explicitly dropped in a 9/16/27 memo. By the summer of 1929, however, SV management had expressed interest in taking over the entirety of the Suncook Loop. A Mr. Hammond, of the B&M, requested a variety of information from B&M sources in order to determine the feasibility of such a change. By August 14, an estimate was put together, and the annual operating expense savings was determined to be about $6,183.84. Additional savings were also projected to result from the elimination of snow plowing on the Loop, and it was suggested that the B&M's Soucook gravel pit, located in Pembroke immediately south of the Soucook River, could be sold if B&M service was ended. With Suncook Mills business healthy, and the other area customers still busy, perhaps this small savings was not significant enough, as no further mention was made in B&M files, and B&M service of the Loop continued. With the establishment of Emerson Manufacturing at the old Dundee mill in Hooksett in 1930, the B&M felt it worthwhile to increase the frequency of service on the Loop, but by April 1931, the effects of the ever- worsening Depression resulted in management relooking at Loop service. The old expense estimate produced two years prior was dusted off and updated, this time yielding an estimated savings of $14,141.66. This new number came in so much higher because included in the Suncook Loop proposal was the discontinuance of the Stone Hill switcher entirely, with Claremont Branch trains being considered as the likely candidates to serve the quarries and other customers north of Concord, and the "OM job," in reference to an existing Lincoln to Mechanicville freight, would be able to pick up work between Eastside (Concord,) and Northfield. Symbol freights W-C 1 and M-O 2 were both candidates to assume switching duties at the Hooksett freight house. B&M trains 303, 3601, and 3604 were expected to continue service into Concord under the proposal, but the future of Train 812 was questionable. However, once again the proposal came to naught, with a final, and surprisingly hopeful, memo dated June 10 being the last mention in B&M files. With stagnating economic conditions over the next couple years, discussion of changes to Suncook Loop service resurfaced by March of 1933. However, once again B&M management came to the conclusion that it was preferable for them to continue the service, and a notice of this position was finally delivered to SV General Manager Fowler on October 21 of that year. While the reasons given to him for their decision were vague, they were elaborated on in the preceding B&M files: lost mail revenue from B&M passenger trains that would continue to run regardless and loss of switching duties in Suncook Village. The entire matter was again considered in June of 1934. The study undertaken the previous year was updated, including a comprehensive analysis of the possible savings to be obtained if F-C 1 were to cease running to Hooksett or Suncook on a daily basis, and if afternoon runs by the Bristol local were similarly curtailed. Still, nearly five more months passed before yet another update was requested, with yet another time study put together. It was determined that three fewer dollars would be saved than when the situation had been looked at earlier that year. Existing records shine no further light on the situation until the following January. Effective an 12,, 1935, the B&M curtails all service over the Suncook Loop's Merrimack River bridges in Hooksett, and simultaneously curtails all passenger service on the entirety of the Loop. Whatever the precise reason for this action was, it quite nearly spelled the end of service into Suncook. With no passenger trains running on the Loop, mail and express were to be trucked, only to be transferred back onto a SV car for further movement to Valley points. Similarly, LCL shipments were shifted to trucks out of Manchester, which were able to provide better service at lower cost than continuing to run freight trains on a daily basis. This being an untenable situation, further discussion must have ensued with SV management, but action continued to be delayed for months. Finally, on December 20, 1935, it was announced in the local paper that permission was being formally sought from the I.C.C., jointly by the Suncook Valley and the B&M, to begin to run valley trains into Concord. The negotiations between the two railroads would drag on for 6 months. Only limited information has become available about the equipment used for these various services. As the trains that operated on the Loop were comparatively minor passenger and freight locals, they were not extensively photographed, and with the attraction of the Suncook Valley itself to rail fans visiting the area, they were just that much less likely to have film expended on them. There is a small number of photos showing details of the Concord-Portsmouth trains, but more research in this area is warranted. Undoubtably, photos taken along these trains' route between Manchester and Portsmouth will yield additional information about the locomotives and cars typically used in this service. However, there are a few particular images taken in Suncook itself that begin to establish a pattern. Two Al Hale photos of Concord to Portsmouth Train 3604 at Suncook show A-44-a 1161 on 5/10/30 and A-41-f 1011 on 9/23/33. Another photographer, N. M. Martin, captured A-41-f 1007 in Suncook heading up Train 3604 in May of 1934. Yet another photo, taken in Hooksett and presumed to be 3604 due to direction and the sun’s position, again has 1007 doing duty. A Spring/Summer Run Book from 1929 states that Engine 1151 shall be assigned to Trains 3601 and 3604 (Run 114,) however, that locomotive was scrapped in 1927. Perhaps this was a typographic error; 1161 may very well be correct. Regardless of the engine number, however, the Run Book lays down that the same power was used on both sides of the Portsmouth-Concord-Portsmouth 3601/3604 run. Trains 3600 and 3605 did not run via the Loop after the winter of 1926, or north of Manchester at all for most of the period, for that matter, although 3600 returned to serve the Loop after 812 had been annulled on 1/4/32. However, it may be of interest to note that the 1929 Run Book showed Motor car 170 as being assigned to those other two Portsmouth trains. There is even more limited information available regarding Train 303. It is also known that B-15-c 1475 hauled Train 303 north from Boston on 12/29/34, while a B&M company memo expressed that an advantage to relocating Train 303 to the mainline in the event service were to be discontinued via Suncook would be that a heavier locomotive than the B-15 in use at that time would be possible, which could then in turn reduce the need for extra trains to haul additional sleeping cars from Lowell when patronage warranted. Photos taken after the period of interest discussed here do show that P-4 pacifies were used on this train after WWII, while dieselization introduced GP-7's in 1952. During the mid 1920’s, the B&M invested in a number of gas cars. Intended to provide cost effective passenger service on low density routes, it is seems reasonable that the Suncook Loop could have been a candidate for the use of this equipment. An April 7, 1927 gas car assignment list shows that one of the 180 series cars was assigned to a Concord to Worcester run, of 161 miles roundtrip. This mileage corresponds to a NH Division routing, and not the “back door” via Henniker. The April 24, 1927 ETT does not corroborate this, as there is no northbound Worcester to Concord train scheduled as a counterpart to southbound Train 812. However the January 15, 1928 ETT shows that two additional runs have been added between those points, 8113 and 8122, and that these trains traveled via the Suncook Loop. However, this service did not last long, as the two trains were annulled between Manchester and Concord by Supplement to the ETT, effective April 2, 1928. The 1929 Run Book shows that Motor car 171 was assigned to Train 812 and 823 between Nashua and Worcester. The motor car would leave Nashua at 7:31 AM, arriving in Worcester at 9:14. Crews would switch, but the car would then depart at 10:35, arriving back in Nashua at 12:21. No other run had car 171 assigned to it, so certainly there was time enough to operate it all the way back to Concord. However, since the run book covers Portland Division runs only, no mention is made of those trains running over the Southern Division north to Concord. By April 26, 1931 (ETT #8,) however, Trains 812 and 823 had schedules that overlapped, making it unlikely that the same equipment would have been used by the two trains, which had a scheduled meet at Clinton Jct. More research can narrow down how those services changed through this time period. There is no photographic evidence to support this claim that gas cars once traveled though Suncook; one is left only to weigh the merits of the paper trail. Interestingly, the B&M briefly considered a request in 1933 by Suncook Valley management to obtain a B&M gas car for use by the line. While it is known that nothing came of the idea, gas cars 1125 and 1126 were suggested as perhaps being the most appropriate, as they could be turned at both Suncook and Center Barnstead and could accommodate the existing milk traffic. Further it was noted that the first of these cars served on B&M Trains 8122 and 8113, while the latter was operating between Rochester and Portsmouth. No photographs are known to exist of B&M freight service in Suncook. However, we know that the last B&M train to operate over the Suncook Loop prior to its lease to the SVRR was X246, which had run down to the Emerson mill at Hooksett on 6/6/36, while Engine 1482 (a B-15c) hauled extra coaches to Suncook for the 1935 NARE Bike & Hike excursion after scheduled passenger service had been terminated. Some inferences may also be drawn from other resources. B&M ETT’s do show weight restrictions on the Suncook Loop, largely due to the wooden bridges over the Suncook River and Merrimack River at Hooksett (the Soucook River and Merrimack River at Bow Jct. crossings were on steel bridges.) Indeed, at least some B&M ETT's showed different weight restrictions north of the Suncook River bridge than they did for the overall Loop. * Minuteman Steam and Jeff Rousseau's Data list show differing numbers for the G-10. It would seem that after the last K-4 locomotive was retired, the largest freight engine permitted on the Loop would have been the B-15c moguls. Additional loading data may yet turn up, but these numbers corroborate what we already know. It would appear that all 2-6-0’s and 4-4-0’s on the B&M, as well as G-10 0-6-0’s, were suitable for the Suncook Loop. The J-1 Trailers and C-15 ten wheelers that were remaining were numerically insignificant, and while they could theoretically show up in Suncook, the likelihood of seeing them was probably very small. ETT #16, Apr 29, 1934, and #19, Sept 29, 1935, (among others?) do show that north of the Suncook River bridge, K-8 2-8-0's and G-11 0-6-0 switchers were also permitted. However, with the large China Mill just on the other side of the river in Allenstown, and Dundee followed by Emerson at the mill in Hooksett, heavier locomotives such as these would only have ventured south if the traffic on that given day would permit. A review of photographs taken by Al Hale, now residing at the Beverly Historical Society, most frequently show 0-6-0 switchers being used on most short haul locals. On the other hand, some longer trips appear to have used 2-6-0 and even 2-8-0 locomotives. There is a series of photos taken on the Franklin Branch in the late 30’s that show a G-10 there, but that line explicitly allowed that class, as well as K-7’s and J-1’s of various subclasses. Re Stone Hill Switcher in 1931... the B-15 moguls currently used on the Claremont branch would be unable to switch the quarry tracks in their current state of disrepair. At that time, a G-10 0-6-0 was being used for that service. Another factor we can take into account is the turntable at Suncook. There was a 50’ Sellers table installed after independent operations began, located just north of Ferry Street in Suncook, that the Suncook Valley used to turn its locomotive for the northbound run. Presumably, the B&M was permitted to use the table as well for the local freight, but we do not know this for certain. First, the table was located on the Suncook Valley proper- not the Suncook Loop, so the Suncook Valley would have to had granted the B&M trackage rights, albeit only a few hundred feet. Two, it is possible that the B&M local’s engine made one half of its trip running in reverse. If the local did use the turntable, however, it limits what power could have been used due to wheelbase and weight limitations. A 50’ turntable was of sufficient length for Class G-10 0-6-0’s, all 4-4-0 type locomotives, and B-15 moguls with the early style tender only. Lastly, there are but a few photos of W-C 1 and its southbound counterpart, C-W 2, and unfortunately they are all from the postwar period. Despite this, it can be noted that the power for this train during that later timeframe was either a K-8 consolidation or a single F-2 diesel, certainly not the sort of locomotives allowed on the Suncook Loop! Special thanks to Brent Michiels and Bruce Davison for their invaluable assistance. Posted 8/15/04. Updated 3/12/17. Copyright by Earl Tuson.